One 2 1/2″ patch, expertly sewn by Falls Creek Outfitters. Three 1 1/2″ weather-resistant vinyl stickers. One year of Postcard Club. You’ll get about four unique event postcards sent to you! A subscription to the Society of Three Speeds email list, where you will be notified of upcoming SoTS events and other items of interest. And, a membership card with your member number! I will endeavor to promote three speeds as a viable means of transportation. I will not denigrate three speed bicycles and will not allow others to disparage these humble bicycles. 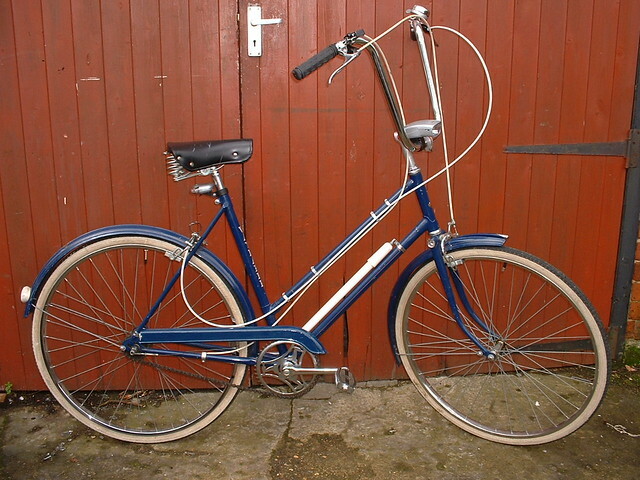 I will ride my three speed bicycle with pride and immense enjoyment. If I have not yet procured a three speed bicycle, I will do my best to obtain one posthaste. Membership kits are $20 plus fees and shipping! Purchase one here. We ship worldwide! Don’t do the whole “ordering stuff online” thing? We can sell them “old school” too. We shall accept Domestic (US) Money Orders, International Money Orders in US currency amounts, and cold hard American cash through the post. We don’t accept personal checks unless we know ya. (And if you have to ask, we probably don’t know ya.) But hold your horses! Before you go ahead and send things willy-nilly through the post, contact us first for info. Email us here. Or, if you don’t even want to email, send a letter or postcard with your return address to SOCIETY OF THREE SPEEDS, P O BOX 14185, PORTLAND OR 97293-0185, USA. We’ll get back to you with prices and product info. But please note that I check my P O box once to twice a week, and am frequently out-of town, so the fastest way to order a membership is online. Here are some notes, clarifications, etc. Please check these first. If I didn’t answer your question regarding membership, email me. Starting in January of 2019, existing members will be able to purchase individual stickers, buttons, and patches a la carte. However, I’ve designed it so that the “best” deal for current and new members alike is to purchase them all together as a kit. You can “gift” folks a membership. In the notes of the order, please indicate full name, mailing address, and email address of the giftee. If you want me to let them know who gifted them the kit, indicate that as well. Membership to the Society of Three Speeds is available to everyone, anywhere in the world. You do not have to live in the Portland area, or in Oregon, or in the Pacific Northwest, or in the US, or North America, etc. While you won’t be able to go on the rides I put on in and around the Portland area, you will still be part of a larger global organization of three speed enthusiasts. We have members from all over the world! Speaking of rides, yes, please do a Three Speed Ride in (insert your town here.) I can’t be everywhere, and while the idea of having a ride in Kansas City or Winnipeg is appealing, I’m not going to be the one to make it happen. But maybe you can? Let me know what you’re planning, and I can try to help. You don’t need to own a three speed…yet. You do not have to currently own a three speed bicycle when you join the club. But you should definitely be into the idea of them, and pursue getting one in the next year or two. A note on membership numbers: Member numbers are given out in the order memberships are purchased. No special requests for a particular membership number, please. No requests to let me know when “we get close to a specific number”, either. Relax. A note on asking questions about whether you “qualify” for joining Society of Three Speeds: You’re already here, you got this far, you dig Three Speeds. You qualify. Don’t make this any more difficult for yourself or for me by asking silly questions whether you’re “right” for this or not. Don’t delay, act today! All in due time. The membership info will be up soon. Thanks for the suggestion! I have been thinking of a circular sticker, and may make on when I make another batch. For now, if you want a smaller sticker, you can simply (and conveniently) cut one of the regular stickers in half, giving you a nice 1.5″ square sticker. OMG, I have found my home. Totally signed up. Will we get/make a FB page? FB? Is this an obscure model of Sturmey-Archer hub? Tell me more! HEHE. I hope not, might have been the ‘fairly bad’ production run. I prefer the Always Works model. Great idea / site. Worried about the acronym — there go a bunch of old SOTS — ha! But mailed my check anyway, today. Thanks! Didn’t know about the Great British Bike Weekend. Tell me more! No, silly, it’s a fronthanded shot. Call me overcautious but paypal and spending money in general gives me the fear! Can you confirm membership prices are back to normal, ie $15 for the rest of the world please? I think it’s a wonderful idea, I’m in England and surprisingly if there’s anything like it here I haven’t found it. Actually i did happen across something but still too far away! By the way…how do you feel about four speeds? Sorry to swear. I have a 1953 Raleigh Lenton Sports undergoing restoration and it’s got an FM hub. Is that ok? If I promise not use fourth..? While the rides generally only happen in Portland, the whole gist of the “society” is that you can be ANYWHERE in the world, so long as you appreciate three speeds. We have members from all over the world. It’s all about supporting the appreciation of three speeds, not whether you can go on a ride I lead. Three Speed Ride 5 June, 2019 at 6:00 pm – 9:30 pm Vera Katz Eastbank Esplanade, SE Water Ave &, SE Hawthorne Blvd, Portland, OR 97239, USA The Pedalpalooza edition Three Speed Ride, open to all bikes. Join us for a 10 mile mostly flat cruise. We'll stop for supplies mid-route and end at a picnic spot to watch the sunset. Blankets, lights, layers recommended.